Week two of training with Némésis. I enjoyed this week even more than the first which is cool because last week was pretty good. Top of the list of improvements was the arrival of some proper training swords. At the moment it’s only single handed swords, the two handed variety being a bit behind in delivery. This was a big improvement over last weeks ‘sticks’ though, and goes to highlight the fact that the club is still pretty new and just getting going. More on the single handed sword later. This week we started with a recap of the basic moves from the first week. I’d been practising quite a lot at home and thought I had this pretty well covered, but was reminded of the point of actually training as the instructor (Aurelien) constantly corrected my stance, technique, step length etc. Little corrections to be sure, but the sort of thing an experienced instructor will see and correct and that you don’t notice on your own. Next we moved onto some new cuts. These were the “Couronne” (I’m not sure about the French here, it’s what it sounds like anyway…) and the Tranche/Taille. 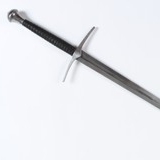 In German Longsword speak these would be the Zwerchhau and Zornhau (more on “Terms” in another post). One thing I did notice was that turning the blade to keep it flat was quite hard. I’m probably the least flexible person ever and my forearms are no exception. Turning my hands palms up to make the blade flat was awkward, but should get better with ease. At the end of the first hour I had serious trouble actually executing the requested move, it’s very much at the cognitive stage at the moment where I have to think what each term means, how that move starts and where it’s going before I can act. At one point the instructor must have thought I hadn’t heard him as it took so long for me to move after he’d called out the move that he asked for it again and I had to explain I was still working on it! Session 2 was single handed sword techniques again, this time with a proper practice weapon. The main difference this made was that it was much harder work. Keeping going for an hour with a heavy single handed sword was a real struggle, holding the stance at the end of a cut for the instructor to check it was like some form of ‘stress position’ torture. So far in single handed techniques we’ve done the straight cut (brise), couronne, tranche and taille, just like for the 2 handed. We also practised (again) the drill with an attack/block move, where the blocker then grabs the hand and pushes it away before attacking with their own cut, from where the drill continues with the actions reversed. This tended to build in both speed and strength leading to a few nervous laughs as we discovered we both seemed to be actually trying to hit each other..
All in all a great session, but my right shoulder is going to be seriously sore in the morning. Sessions started yesterday for the Académie Némésis Medieval fencing. I had some ideas about what we might be doing and how it would work, but there were a few surprises too. The club is actually quite small, probably less than a dozen members. I discovered quite early on that it has only been properly in existence for just over 6 months , so I’m joining as it is starting to get established. I quite like this as it means things are still a bit new for all of us, not just for me. There was one other ‘Débutant’ last night night who had never really held a sword before so the two of us were paired up and spent most of the evening practising/drilling together. Before that, however, was the warm up. Now, I had been expecting to come away from the first training session with sore arms and feeling pretty tired. I wasn’t expecting this to be the result of pull ups, press ups and sit ups. We started each session (there were two last night) with some pretty demanding physical exercises. I have to say that although I consider myself reasonably fit and quite strong, I didn’t manage to exactly keep up with the required numbers of reps…. That means leading with the back foot – OK I have it now…..
Inorder not to have to spend the entire evening walking forwards, then backwards, we then progressed to a basic thrust and a hanging guard parry. The main instructor explained his plan was to return to the basics each time until we had them completely consolidated, but in the meantime introduce more new elements each week two. Sounds like it’s going to be hard work then. After an hour we had a break, then warmed up (again!). The second session was looking at single handed techniques including an introduction to the idea of grappling to grab your opponents hand and move it away. This was more interesting than I had thought it would be. My main interest at the moment is the Longsword but actually I quite enjoyed the single handed stuff. So overall how did it go? Pretty well I think. It was good fun, the other people were welcoming and seemed keen to have new members join. The language was a bit of a barrier but I’m determined to work on that. The training ‘swords’ were essentially straight wooden poles. Next week I’ll take the synthetic longsword and see if I can use that instead. All of the terms used were French. I know it’s a club in French speaking Suisse Romande but I was maybe expecting to use the German terms from the source material. I’ll continue to study these and make sure I know them well myself for my own benefit. When someone cuts against you from above from their right side, so cut with a strong Zornhau with the long edge from your right shoulder. If he is weak in the bind, thrust in with the point along his blade to his face, and threaten to stab him. I found a whole load of interesting stuff. The quote above comes from a complete translation of Ringeck on the website wiktenauer. There are many more sites I visited and either bookmarked or, in some cases read and then moved on. A good example of the latter would be the website of the ARMA. Lots of articles and essays but in the end I thought just a bit too much of one man’s voice and his opinions. My head is now stuffed with half-understood terms and techniques, a mix of Italian and German styles and precious little practical knowledge. I really, really want to start practising some of this stuff. Summer is nearly over and that great French event la rentrée is almost upon us, then finally I can start training. After I realised that there were people out there learning to do ‘proper’ sword fighting, I got pretty excited at the thought of maybe finding a club near me. Of course, nothing is ever that simple. Living on the France/Swiss border at Geneva I had to first find out what on earth this sport was even called in French. Having worked out it translates as “Escrimé Médievale” I then made it to the AMHE website, which helpfully has a map with various clubs marked on it. Turns out there are quite a few places within a half to one hour drive. That’s the good news. Unfortunately there’s a little more to it. I tend to work weekends and will often be away from Thursday to Monday. This leaves….Tuesday and Wednesday evenings. My wife already has a gym class on Wednesdays so that restricts me somewhat to just Tuesdays. Basically I needed to find a club which practiced medieval swordfighting, within an hour of Geneva, which met on a Tueday. Hmmm. Having looked at the various options I was seriously considering two. GaGSchola, Geneva. These guys look like they take it very seriously, studying the original texts ad trying to get the authentic techniques from the historical documents. Also they’re pretty close. Downsides? They don’t meet on a Tuesday, but on a Monday. I’d love to train with them but I’m pretty sure I’d only make about 1-2 sessions a month. I’m still planning to go and see them, to see what my options are. Académie Némésis, Nyon. Again this club seems to be keen on medieval fencing as a a sport rather than a theatrical display. Apart from that I’m not sure, I guess when they start up again in Spet I’ll find out as I’m planning to go along. I hope it works out OK because, crucially, they’re 25 mins away and meet on a Tuesday. Yay! So these are my two hopes at the moment. Regular Tuesdays with Némésis and, if I can, some time with the GaGSchola. It’s a bit limited really as I’d like to be able to be more specific (for instance German rather than Italian school…of which more later) but I’ll start with what I can find and take it from there. So, this first post is a quick explanation of how I came to be here writing this blog. Nothing really training/sword related, just background. I guess like most guys I had a fascination for knights, swords and fighting in general. As I grew up I never really developed this though. I remember thinking back in my late teens that it would be cool to learn how to properly fight with a sword. I looked at fencing (modern) but didn’t really see anything there that clicked. It was too rule bound, too formalised and just not real. Those thin bendy foils weren’t my idea of swords. I wanted to fight with a proper sword, but never really found what I was looking for. In the end it was a medieval festival that got me started. Every year there is a big event near us which I went to in May 2012. 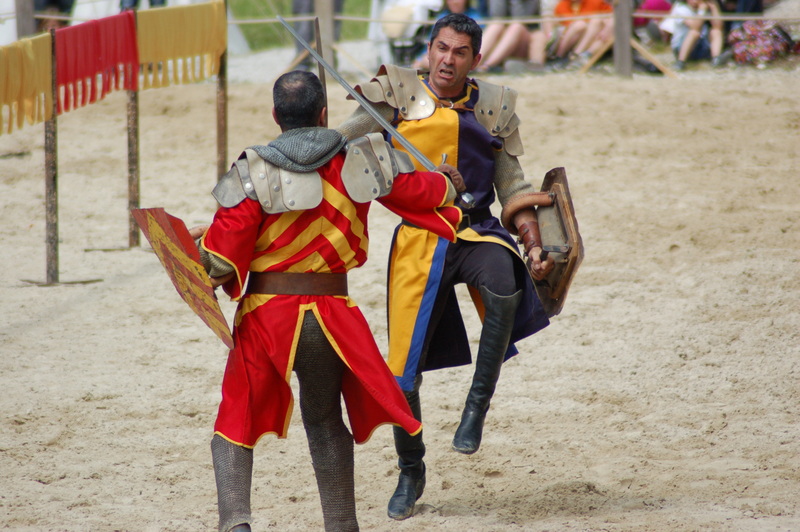 There was plenty to see including the usual displays of jousting and sword fights. These are great fun, but you do wonder why they spend so much time hitting their swords together like morris dancers, and not actually hitting each other. I thought again about getting a sword and decided to look online, initially just for something I could take along next year. After lots of searching on the internet (including a very useful stop on this site) I knew a lot more about swords, specifically how badly made a lot of them were and what a proper sword actually was. I also stumbled by chance onto the section ‘How to use it’. That got me thinking again, if I was going to get a sword shouldn’t I know how to use it? I realised that there were now plenty of people looking at authentic techniques and teaching themselves from the manuscripts of the ‘masters’. Finally I found what I’d been looking for all those years ago.